Let the wild rumpus recommence! After 30 years, renowned author/illustrator Maurice Sendak is back with a sly new picture book oozing with revelry and rhyme. Mr. Sendak, whose classic Where the Wild Things Are won the 1964 Caldecott Medal, has returned to that dark and fertile territory where youthful rebellion leaves room for love, forgiveness, and reconciliation. 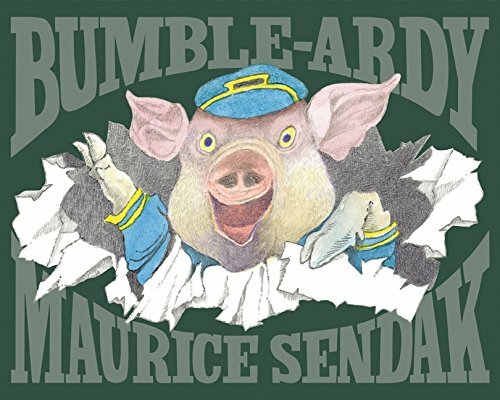 Peering from the cover, the yellow-eyed pig Bumble-Ardy, donning a blue sailor cap perched between big petal-pink ears, looks as if he’s ready to party. Is he ever! Sweet Aunt Adeline, dressed in a Victorian pink and lavender dress coat, presents the birthday pig with a “hotsy-totsy cowboy costume” and a hefty, candle-laden cake—but no party. Bumble-Ardy throws on the suit, lassos his stuffed pig, and preens in front of the mirror. The reflection of the pig’s mischievous expression ushers in a shift in the story’s tone. Bumble-Ardy proceeds to invite “some grubby swine” to join him “for cake and brine at ten past nine.” Which sounds fine, except for the fact that his aunt must leave the house just minutes earlier to go to work. And Aunt Adeline does not approve of pigs guzzling her fine, homemade brine. That’s not enough to stop this nine-year-old from breaking the rules. After all, we are in Maurice Sendak territory and have encountered “some swill pig,” as a yellow banner proclaims. Here’s the author’s opportunity to unleash his own wild imagination and wicked sense of humor. As he did in this story’s first incarnation, a 1971 animated short produced for “Sesame Street” by Jim Henson, Mr. Sendak spins a simple plot that pits an impish boy against the constraints of his old-fashioned matriarch Adeline. The author/illustrator changed the wine to brine and the impish boy (reminiscent of the author’s famous Max) to a pig. Happily, the picture book format allows for greater exploration of the sights and sounds of Bumble’s escapade. Surprises both bright and dark abound for the reader. Various signs carried by swine both further the plot and enrich it with humor and words that rhyme with nine. Banners and balloons in pink, blue and yellow display that word in various languages—Italian, Hebrew, and Dutch—and foreshadow the wide-ranging mayhem to follow. For oinkers with large yellow eyes—or readers with more mundane irises—Maurice Sendak has delivered an unexpected treat that’s simply divine.